Does it say exactly what will be constructed? The Proposed Multimodal Program does not say exactly what will be constructed, but given the $22.4 million construction cost, my best guess is that it will include construction of a Holmes Road interchange along with the widening of Lamar Avenue to six lanes. Perhaps the $42 million construction cost estimate would feasibly cover the construction costs of the widening to six lanes and the Holmes Road interchange? The Tennessee Department of Transportation plans to try again next year for a federal FASTLANE grant to help with a $300 million overhaul of Lamar Avenue. The state's application for $180 million isn't among inaugural FASTLANE program grants that are expected to be made final in September. A freight industry advocate, the Coalition for America's Gateways and Trade Corridors, said the Memphis project was among several noteworthy efforts that didn't get funded. Officials with the group said the outcome disappoints them and they intend to push for more money in coming years for projects to improve the flow of goods. While some states submitted multiple applications, Tennessee got behind the Lamar project, touting the corridor's role in 42,000 jobs and more than 20 Fortune 500 companies. Spokeswoman B.J. Doughty said, "TDOT does plan on applying for the grant again during the next cycle, which will be next year. The FASTLANE grants are available for the full 5 year cycle of the Fast Act." "In the meantime, we will stay the course using our available funding to the move the many phases of the Lamar Avenue project forward," Doughty said. Doughty said TDOT would be working with the federal agency to improve the application. "When TDOT looked at the states who were awarded FASTLANE grants this time, they had far greater investments on the state level than Tennessee had initially proposed and had also asked for less federal funding. That will be something else we look at when completing the next application," she said. The Coalition for America's Gateways and Trade Corridors said the FASTLANE program was created in response to pressure for a freight-specific grant competition, following several years of TIGER grants (Transportation Investment Generating Economic Recovery) program awards that were divided among a diverse mix of tranportation projects. "Based on the very limited information provided by U.S. DOT on the awards...we have (been) able to determine that at least 16 percent of (FASTLANE) funds were awarded to non-freight projects," coalition spokesman Jeff Agnew said. "However, with respect to the 84 percent, it is difficult to discern how much of the funding went to actual freight projects or projects with a freight component," Agnew said. Earlier this year, TDOT applied for a $180 million grant through the federal Department of Transportation. With the funds, Schroer estimates it would only take five years to expand four-lane Lamar to six lanes and construct new interchanges at three heavily congested intersections. TDOT threw all of its weight behind the Memphis project while other states submitted multiple applications for the federal FASTLANE grant. The Greater Memphis Chamber coordinated the grant with the Memphis Metropolitan Planning Authority – the Mississippi Department of Transportation and the Arkansas State Highway and Transportation Department submitted their support as well. With Memphis out of the running for receiving a federal grant this year, TDOT has pledged to inch forward by acquiring right-of-way for the first phase of the project, which should cost around $500,000. Some of those costs could be lessened if a company elects to donate its land. Schroer said Lamar has been a local priority for nearly 10 years. Last April, TDOT allotted $3 million for right-of-way acquisition for the first phase of the Lamar project, which extends from the Tennessee/Mississippi state line to Shelby Drive. Schroer expects right-of-way acquisition for the first phase will take about two years. 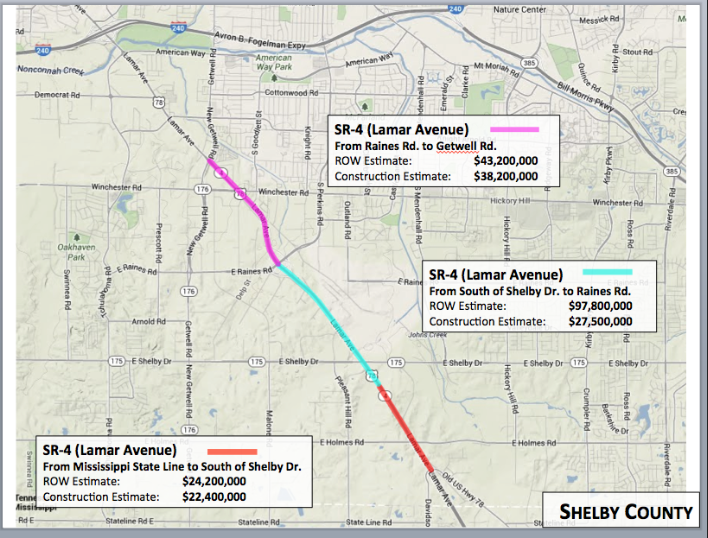 At that point, TDOT will begin construction and then right-of-way acquisition for the next phase, which extends from Shelby Drive to Raines/Perkins Road. The final phase of Lamar’s extension ends at Getwell Road. I'm not very familiar with this project or the area, but are there plans to improve Lamar Blvd to a freeway west of Getwell Blvd all the way to I-240? That would seem to be the logical next step to me, especially if I-22 is planned to extend over this corridor. I think the cost to upgrade to a full freeway would have produced negligible benefits versus putting in additional interchanges at major routes and adding travel lanes which is why that is not being pursued at this time. Safety would be one major benefit of extending I-22 along Lamar Ave. all the way to I-240. There's so much industrial and freight activity in that area. It's not really good to have that much semi truck traffic going through a bunch of stop and go intersections. There is a lot of major improvements needed in that area on Memphis' South side. Memphis Int'l Airport is right there in that area. A fully complete I-22 could help serve traffic going in and out of the airport. Some improvements are being made to Plough Blvd on the West side of the Airport to I-240. It curves under the runways and turns into Winchester Ave., which is just a basic surface street. But it has a lot of traffic on it, including lots of trucks. Upgrades to TN-176 and Lamar Ave. could at least get traffic in and out of that area a little better rather than getting it all backed up at the signal lights. If US-78/I-22 can be upgraded to a freeway as far as TN-176/Getwell Road that might open an option or two for ultimately connecting I-22 to I-240 in the long run. The best thing really would be keeping the freeway aligned along Lamar Ave. But it might have to be elevated on those last few blocks to I-240. Lots of people don't like elevated freeways. However, that's not a "pretty" area of Memphis. There's lots of warehouses and other industrial stuff which really wouldn't be slighted by an elevated section of super highway. If they want to save space maybe one direction of lanes could be routed over Lamar to I-240 and the other direction of lanes could be routed up Getwell Rd to I-240. Meanwhile, existing development would be one major reason NOT to pursue such a freeway upgrade, as has been noted upthread. If some access management (suitable for trucks, of course) is employed along with interchanges at major roads, Lamar may flow pretty well. A decent amount of property will have to be taken for the intersection upgrades on US-78 all the way to Getwell Road. It's not clear to me if they'll have US-78 upgraded fully to a freeway to that point or still have some driveways attached to it between the freeway style intersections. The last 2 miles between Getwell Road and I-240 are particularly thick with development. There's no way a conventional freeway upgrade could be pushed through there without erasing all the businesses on at least one side of the road. Obviously that would be very costly and very controversial. On the other hand, an elevated freeway that split the Southbound and Northbound lanes apart on different viaducts, kind of like the end of I-44 in Wichita Falls, wouldn't need to demolish a lot of property. They could also take a long term approach, slowly buying up property and ROW as businesses come and go. Well when the businesses set up shop there they knew what they were getting into. There is no need to upgrade to fully controlled access. You may be able to have an elevated express lane or two at an intersection. How about turning te freeway north up Getwell to I-240. Lots less property to take. The problems you run into with Memphis is that you can be accused of gentrification with these freeways you are proposing. That would be the logical solution. Maybe if/when the section east of Getwell (they've been taking about an interchange at Shelby Drive for over two decades without ever shovelling dirt, hence my skepticism) is upgraded TDOT will feel the need complete a direct freeway connection. 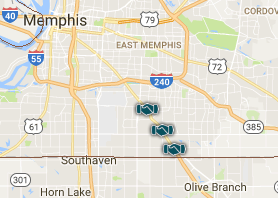 78 is way too developed in Memphis IMO, building 22 around would be easier. I sincerely hope Tennessee passes Governor Haslam's proposal to raise the gas tax and index it to inflation. It is sorely needed. I'm not sure of the time line, but funding is in place. Also, they have submitted a FASTLANE application, which, if awarded, would really accelerate the process. "running white man's roads through black man's homes" Imagine you have heard that one. Any potential improvements to the route should be confined to the industrialized US 78 corridor. Not spread out into adjacent residential areas. The whole Lamar issue stems from the initial push by then-Sen. Trent Lott (R-MS) to designate I-22 over US 78 circa 2000-2001, prior to the scandal that ended his career. There was no love lost between Lott and (again) then-Sen. Bill Frist (R-TN), who succedded him as Senate majority leader in '02. Frist wanted no part of the I-22 corridor, assuming (with some insight!) that it had limited benefit to his state. The I-22 "cause" lay dormant for a while before Alabama, in the form of Sen. Shelby, took up the gauntlet in 2003 and got I-22 onto the books the following year. Lamar Ave.'s proposed upgrades are simply a local attempt to relieve the congestion on that street; the concept of a full freeway extension of the MS US 78 continuation of the I-22 corridor to another Interstate freeway facility isn't part of the official agenda (although likely in the back of some folks' minds). New freeways inside the 269/385 loop, with the exception of I-69 paralleling US 51 north of town, just aren't on the radar due to the likelihood of local political opposition for the reasons cited above. Overton Park is still an active memory with Memphis circles; in this case, it has been deemed best to let this sleeping dog just lie! If they can extend the I-22/US-78 freeway as far North as New Getwell Road there are plausible ways to get the freeway extended the rest of the way to I-240. Obviously the best thing would be building a new freeway along the existing US-78 corridor, but such a conversion would only happen gradually over many years unless people in Tennessee and Mississippi wanted to get this done like some of the big freeway expansion projects that have happened in Texas. This situation is not nearly as ambitious or costly as something like the Katy Freeway expansion in Houston. The portion of US-78 between New Getwell Road and Knight Arnold Road looks pretty run down to me. I wouldn't be surprised if more than a few commercial property owners in that area would love to be bought out (if the price was right). I could see "Future I-22" being extended to that intersection at the very least. Then it's only 1 mile between Knight Arnold Road and American Way. The US-78/I-240 interchange is just beyond that. One possible alternative: near the intersection of US-78 and Knight Arnold Blvd there is a large amount of land that was cleared of property -a site labeled in Google Earth as the Walter J. Simmons Estates Neighborhood Association. There's just foundation slabs and over-growth there now. There's more than enough space to send I-22 through there and curve it back over to the existing US-78/I-240 interchange. But it would have some negative impact on Nash Buckingham Park and come near American Way Middle School. The planned improvements include widening Lamar Avenue from four to six lanes from the Tennessee-Mississippi state line continuing north to the currently six lane section at Getwell Road. Three congested intersections would also be upgraded to new interchanges. · Near Raines Road/Perkins Road Interchange to Getwell Road (1.8 miles) – Right of Way acquisition to begin in Summer 2019, construction scheduled in Fall 2021. That was an old housing project that was torn down. My understanding is that the city of Memphis is putting a municipal complex on the Walter Simmons property that will house the Public Works and other city departments. The creek that runs through there can get some pretty heavy water movement during heave rains from what I remember when I lived in Memphis many years ago. That's great news! I just came through the area today and the pavement is in horrible shape, and the traffic lights are annoying as well. The more interchanges they can squeeze in from the I-240 freeway down to the TN/MS line, the better! IMHO, Tennessee has really painted themselves in a corner regarding US 78. Now, they are trying to get ROW for more interchanges and widening, which the minimum ROW distance should have been enforced back when they began to 4 lane 78 to the MS border. New, wider pavement will be nice. 3 more interchanges is also good. Overall this will be a decent, yet modest improvement. It doesn't sound like the freeway would be extended all the way to Getwell Road even though that's what really needs to happen. A 6-lane freeway flanked by frontage roads would be the best solution. -----7 driveways up to Tuggle Rd, 3 WB, 4 EB; 1 median crossing. -----16 driveways up to Shelby Dr, 5 WB, 11 EB, 4 median crossings. -----4 driveways up to Pleasant Hill Rd, 1 WB, 3 EB, 3 median crossings. -----5 driveways up to Winchester Rd, 2 WB, 3 EB, 0 median crossings. -----16 driveways up to Winchester Rd, 7 WB, 9 EB. The last 2 miles of US-78 leading up to I-240 is quite a clusterf*** of driveways and intersections, including 5 more traffic signals. The upshot is most of the property is commercial, not residential. None of it is post card material. A bunch of it looks kind of run down. It might not be as difficult to buy out properties and acquire right of way as it is in other better looking locations. Still, even if property owners along US-78 are more than willing to sell, it's still going to take a whole lot of money to extend what could be I-22 the rest of the way to the I-240 loop.